This entry was written by Sarah Jenkins, posted on 08/08/2015 at 10:56 pm, filed under Youth 2015 Tour category. We checked out of the Prima hotel and then headed up above Tiberius on our way to the Arbel cliffs. We want to get there before it gets too hot . Once we arrive, we make a 20 minute hike from our bus to the summit. 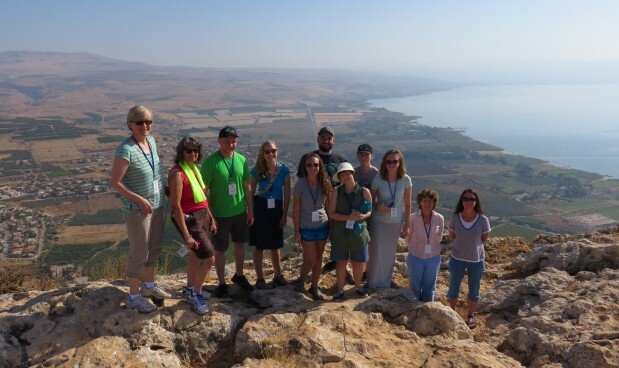 We get an incredible view of the Sea of Galilee and the places we visited. The Arbel is mentioned in the Old Testament. It is a very special place to Jews for prayer and more, as well as to Christians. Although we dont know for sure if Jesus came here, it is likely that he did. We leave the cliffs of Arbel to visit Migdala, situated just below the cliffs.Here we get to see a first century synagogue that Jesus and His disciples visited. It’s not a restoration, but the real thing unearthed from a 2000 year hibernation . It’s incredible to think Jesus walked through this door and on these mosaic floors that we can see and touch . Next we see the Mikva baths, which were found in pristine condition. Migdala was a city much larger than archaeologists and historians had previously realized. It was a major center where fish were processed and shiped to locations as far away as Rome. We also visit a chapel on these grounds that is dedicated to Migdala’s most famous resident, Mary Magladene, along with other significant women of the New Testament . After Our visit to Migdala we visit St. Peter’s Primacy, a nearby location on the shores of the Sea of Galilee. This is the traditional site of Jesus breakfast with the disciples after the resurrection. We see the church which has been built over the site many believe Jesus cooked fish over a coal fire. This may indeed be the place where Jesus challenges Peter three times: “Do you love Me? Then feed My sheep.” This request echoes the three times Peter denied Jesus by a coal fire outside the house of the High Priest in Jerusalem, the night before the crucifixion. Jesus forgives Peter for his denials, and restores him to ministry. At at St. Peter’s Primacy we collect shells on the shore of the Sea of Galilee as souvenirs of our visit. Next, it’s a bus ride along the northern shore of the sea. We see the place where Jesus drove satanic spirits into pigs, and then caused them to run over a cliff. We can also get a look back at Tiberius. Before long we arrive at Yardenit – we have a lunch of falafel and salads waiting for us. Yardenit is a baptismal site in a tributory of the Jordan River. Today, Pastor Aker baptizes Edward in the waters of the Jordan. Afterward, everyone take some time to shop for date honey and other items at the stores run by the kibbutz.The group gets its last look at the Sea of Galilee before turning south on Highway 90. We are heading to Bet Shean, one of Israel’s great archaeological treasures. The temperature outside the bus has climbed to 109.4 degrees F. Everyone does all they can do to prepare for the weather. Terrie has a water bottle with a spray attachment. Several are trying frog togs – a neck-worn fabric that you wet and it keeps you cool – in theory. When we exit the bus the heat really hits you – it’s like an oven. We make our way into the excavations – no crowds, hardy any at all – big surprise, with the boiling heat! Bet Shean was one of the ten cities under Greek rule known as the Decapolus. It was destroyed by an earthquake centuries ago and abandoned only to be rediscovered in the 1980s when excavations began. It’s an incredible site and several of our group audibly gasp when they see it. It’s definitely a wow moment. We get an overview from Yuval and then Pastor Mark Jenkins leads the group on a quick tour of the city. We stop on the theater and Pastor Austin walks down to the stage for a little demonstration: “can you hear me now ” he speaks in an ever lower voice until he is practically whispering – we can hear him perfectly well even from the top of the theater more than 85 feet away. No need for a sound man in this theater. Next, its a look at the public restrooms of long ago. It’s an amazing system of plumbing for something 2000 years old – but not what you would want to contend with today! After the tour of the bathrooms the group is hurried along to the Cardo, or city market, along what would be the Main Street . Temps are now approaching 113 degrees so we don’t take long. We push to make it back up the hill and head straight to the gift shop for cold drinks and once cream. It takes a long while to recover but we are happy no one suffers a heat stroke. The bus is air conditioned and a welcome refuge. Tired from the heat, our group doesn’t take long to fall asleep on the way up to Jerusalem. We make a quick rest stop near Jericho just before making our ascent into the mountains and to the holy city. After a restroom break and some soft drinks the group is awake and ready to drive another 30 minutes up to Jerusalem. The bus takes the group to Mt. Scopos, where we stop to get a good view of the city. Pastor Aker reads to us from Psalm 122. It’s an exciting memory to be there. After some pictures we reboard the bus to go into the old city to our hotel. Actually, the bus can’t go all the way there, so we have to meet our a van to schelp our luggage while we walk in on foot. We enter the Jaffa Gate and our hotel, the Gloria, is very close by. We have to hurry to get our dinner as we have special guests that are coming to meet us. Anna and Yair Pinto join us for dinner and then after we go up to the rooftop of our hotel to a lovely spot overlooking the city. Here we meet and talk with Anna, a Christian who served in the IDF, and Yair a tank officer and a Jewish Believer in Yeshua . 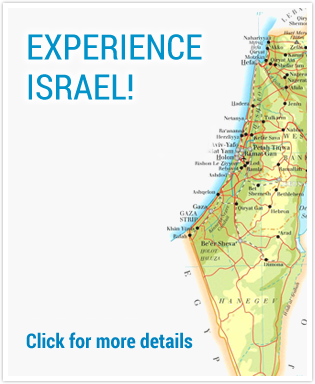 It’s a great time to dialogue about Israel and the issues. We spend a couple of hours in the now cool night air. It was a wonderful blessing, and a great way to begin our stay in Jerusalem . We turn in afterward, tired but feeling privileged to be here.